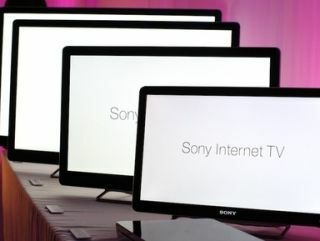 Sony has revealed its latest range of Google-powered internet televisions at a press conference in New York this week. Sony claims to be offering consumers the "world's first HDTV powered by Google TV" with the top-of-range 46-inch model available immediately in the US priced at $1400 (£883). Official UK pricing and availability is still to be announced. Sony revealed four Internet TV models, with pricing as follows: 24 inches ($600/£378), 32 inches ($800/£505), 40 inches ($1000/£631) and 46 inches ($1400/ £883). Sony's Internet TV uses Chrome for its Google TV browser and is fully compatible with Google TV's Android ecosystem. The consumer electronics giant also revealed a full QWERTY-keyboard packing remote control for its Internet TVs, which has apparently borrowed design elements from PS3. All the televisions feature built in Wi-Fi are1080p edge-lit LED sets, other than the bottom-of-range 24-inch model, which is CCFL-backlit. Each model also features four HDMI inputs and four USB ports. Sony is also offering an accompanying, Internet-capable Blu-ray player, with built-in Google TV priced at $400 (£252). We expect to hear more details on UK pricing and availability from Sony UK shortly, so stay tuned for updates.